Altair Aerial Blackhawk Drone Review 2019 – is the Altair Aerial Blackhawk quadcopter worth the money? Review of features, pricing, flight duration, battery, camera and more. 15-17 MINUTE FLIGHT TIME: The Blackhawk Flies for up to 17 Minutes on Medium Throttle Flying. The Altair Aerial Blackhawk is a long-range drone Drone that was built with speed and control in mind. This is an affordable quadcopter that gives you 15-17 minutes flight time at high or low speeds. It handles well in windy flying conditions and the camera mount is compatible with the majority of the action cameras in the market. This a brand new drone from the Altair Ariel drone company that has intermediate fliers in mind. • 15-17 minutes flight time which is a lot of airtime for a drone in Altair Aerial Blackhawk’s price range. You get to enjoy the beautiful scenery for an extended period. • 300-500 meters operating range allows you to have the drone in your sight and still enjoy exciting and full control flying. • Camera mount compatible with Hero 3 and Hero 4 GoPro action cameras. The body of the drone is made of metal and is green in color. The attached parts are colored black. 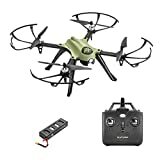 The military green and black colors scheme are easy on the eye, and it gives the drone an appealing appearance. Altair Aerial Blackhawk is a heavy and powerful Drone that is surprisingly fast as well. This heavy metal quadcopter does not have an inbuilt camera, but it comes with a camera mount that is compatible with GoPro Hero 3 and Hero 4 cameras. This drone packs impressive features, and it is well suited for outdoor flying. The 6-axis gyro stabilizes the drone, and the basic remote controller has clearly labeled tuners to provide you with total control. The extended flight time this drone provides allows you to enjoy the beautiful scenery before the battery runs out. It handles extremely well in windy flying conditions and you can perform 360 degrees flips on one axis. The 300-500 meters operating range allows you to fly the drone far without losing sight of where it is. Altair Aerial Blackhawk can achieve both high and low speeds, and you get to fly high and get bird-eye shots. As a beginner, you can start with low speeds and advance to high speeds with time. The most impressive features of this drone are the unmatched flight time and the long operating range. Altair Aerial Blackhawk Drone is a budget drone with high-end features and excellent flight performance. The quadcopter has been built mainly for recreational use because you can fly high and get hard to reach shots. 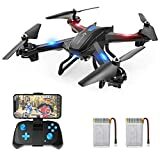 As a videographer or photographer on a budget, you can use this quadcopter with your GoPro cameras to capture sharp and clear still and motion pictures. The drone has a smooth take-off and landing, and there is an extra set of propellers in case the ones you are having get damaged. Altair Aerial Blackhawk does not come with an inbuilt camera, but it packs a camera mount that is compatible with GoPro Hero 3 and four cameras, as well as, some other action cameras. The brushless motors allow you to record audio so that your videos have more character. The Altair Aerial Blackhawk Drone has 15-17 minutes airtime, so you get enough time to line up perfect shots. Due to the different speed modes and the long operating range, there is a lot you can achieve with a camera mounted on this quadcopter. GoPro cameras capture excellent quality videos and sharp images. Altair Aerial Blackhawk stands out because the exclusion of an inbuilt camera allows you to use high-quality cameras and upgrade when you need to. The remote controller is a basic transmitter that is easy to use. All the buttons are clearly labeled, and the controls are straightforward. The 7.4v LiPo battery gives you 15-17 minutes airtime which is a very attractive feature. The battery is mounted at the bottom of the quadcopter, and you also have the option of buying extra batteries, so you enjoy flying the drone for longer. The Altair Aerial Blackhawk Drone is a brand new drone that is more superior and powerful than its predecessors. AA108 and 818 were drone built for beginners, but the Blackhawk is for intermediate fliers. With the Altair Aerial Blackhawk Drone, you achieve more speed and get total, control as you fly, it. This is a straightforward drone that gives you 100% control. The durable body can take several minor crashes, and you get an extra set of propellers in case of damages. Altair Aerial Blackhawk has long battery life that allows you to enjoy the beautiful scenery and even record audio. This is a heavy metal quadcopter that is surprisingly fast and stable even without a GPS feature. The Altair Aerial Blackhawk Drone is a valuable investment as it has superior features and excellent flight performance. This drone packs high-end features and a durable body that can take minor crashes. If you are looking for a beginner drone, consider purchasing Altair Aerial’s AA108. The Blackhawk is built with intermediate fliers in mind. The 15-18 minutes flight time is a lot of airtime for a drone in this quad’s price range. 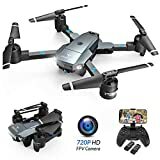 If you already have GoPro cameras, purchasing this drone is a no-brainer as it gives you the opportunity to give your Hero 3 or Hero 4 camera a spin. 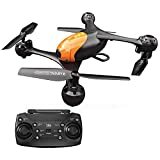 Based upon feedback submitted by over 30 customers the Altair Aerial Blackhawk Drone has received a 4.5 out of 5 star rating. We discuss why in this review article.